1946-1954  Square and folk Dance Directory. Compiled by Art Corral and Rod LaFarge. Paterson, N.J.: La Farge. (This directory and its predecessors, Rod's Dance Directory and the North Jersey Country Dance Guide: 1951-1954, reprinted the directory listings that appeared in Rod La Farge's magazine Rosin the Bow. 1951-1955  Folk Dance Guide. Schwartz, Paul. New York, N.Y.: Paul Schwartz, 1950-1955. Philosophy, history, list of dance groups, and bibliography. The SOFDH archives contain editions 2, 5, and 8. 1972-1979  Folk Dance Directory. Ray LaBarbera. New York: N.Y.: Ray La Barbera, 1972-1979. Later incorporated into Mixed Pickles. Ray LaBarbera. New York: N.Y.: Ray La Barbera, 1977-1979. A New York folk dance newspaper consisting largely of LaBarbera's folk dance directory and calendar. 1999-  Folk Dance Directory: An electronic directory published on the internet by Ray LaBarbera, following the organization of his 1970s' endeavors. 1974-  Folk Dance Directory 1974, The. Tony Wales, ed. London: English Folk Dance and Song Society, 1974. International (largely British and European) listing of folk music and dance groups and resources. 1978-1989  People's Folk Dance Directory. John Steele and Sue Havorka. Austin, Tex. : John Steele and Sue Havorka, 1978-1989. 1977-1978, 1978-1979, 1982, and 1989 editions. 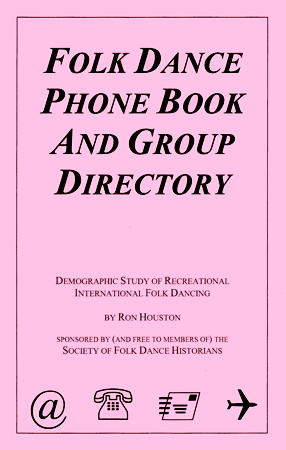 1993-  Folk Dance Phone Book and Group Directory. Ron Houston. Austin, Tex. : Society of Folk Dance Historians, 1993-. An annual publication containing contact information for thousands of dancers, hundreds of groups, dance callers/teachers, musicians, vendors, ensembles, and camps, and dozens of lecturers, institutes, publications, and song teachers. FREE to Society members. 1954-1957  National Directory of Square and Folk Dance Callers, Teachers, and Leaders. St. Louis, Mo. : National Directory Service. 1954-1957. Paper cover, 4 x 6 (Second edition, 1955). Several hundred new names, 600 corrected addresses and some 350 deletions of people who have dropped out of the picture. Handy item for the travelling dancer or caller. Reviewed by Rod LaFarge. 1994-  Various imitations of the People's Folk Dance Directory issued by individuals or organizations in San Antonio, Texas.